Lynne graduated from Caldwell College in 1998 with a Bachelors Degree in English. In 2001 she graduated from New York Law School where she served as the Vice President of the Legal Association for Women. 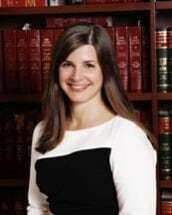 Upon graduation from law school, Lynne served as a law clerk to the Honorable James G. Troiano, in the Superior Court of New Jersey, Essex County, Family Part from 2001-2002. After her clerkship, she was an associate with the law firm of Kozyra & Hartz, LLC for two years before joining Iacullo Martino, LLC in 2004. Lynne devotes her practice exclusively to matrimonial law and related issues, such as divorce, post judgment support and custody modifications, custody disputes, pre-nuptial agreements, domestic violence matters, and parental defense in Division of Child Protection and Permanency proceedings (formerly Division of Youth and Family Services, "DYFS"). Lynne regularly serves on the Essex County Early Settlement Panel and has been appointed by judges to serve as a parent coordinator in high conflict cases and to serve as a guardian ad litem.